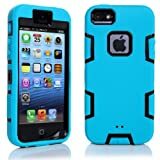 M-LV Apple iphone 4S 4 4G Blue with Black Hybrid Dual Layer Hard Soft Silicone Armor Defender Protective Case Cover, With Screen Protectors, M-LV Stylus and Cleaning Cloth (UPC 695131963081) is sold at the following online stores. We've find the latest prices so you can compare prices and save money when making your purchases online. Please click on the links below to browse to each store's webpage.